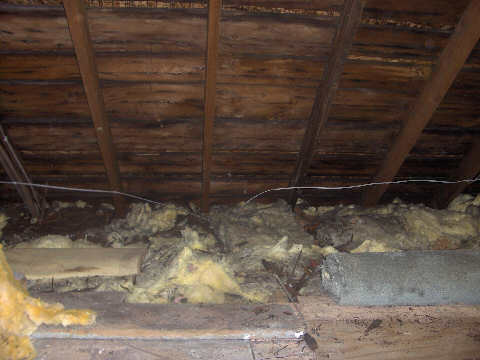 The next project on the list for ER’s house is adding attic insulation. The house as is has about 1.5″ of rock wool insulation, and about 5″ of fiberglass above that. So, the attic is insulated to about R-19ish. This is a far cry from the recommended R-50 to R-60! So, to remedy this situation, I decided it would be best to blow cellulose over the top of the fiberglass. I chose cellulose for a number of reasons. Cellulose is a nice environmentally friendly option for insulation. Installing cellulose is cheaper than fiberglass rolls, and its much easier to install. It also stops airflow much better than fiberglass. In my book cellulose wins hands down. The first thing that needed to be done was to clean the attic. The previous owners only left a few boxes and carpets in the attic so that went quick. However, the roof on the house was just redone several months ago and the roofers made a horrible mess of the attic. There were tons of nails, wood chips, and more dust than you could ever sneeze at. So, I got out the broom and shop vac and started cleaning things up. To help with the clean up of the nails I got out a large magnet I had laying around. This did pretty well picking them up. This is what it looked like before. The next step in this process was to seal the attic. 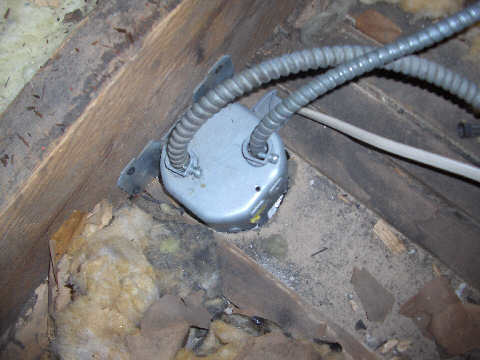 This means pulling back the fiberglass and rock wool and filling any holes or gaps that might let air pass easily into the attic. This is easily done with either caulk for small holes and gaps, or expanding foam (Great Stuff) for larger holes and gaps. I recommend finding where all the wiring goes, because they have to drill holes to get the wires through the ceiling. Also, junction boxes can leave huge gaps as well. Seal them up so air doesn’t get through! Here are a couple examples of the work and what I found in my attic. 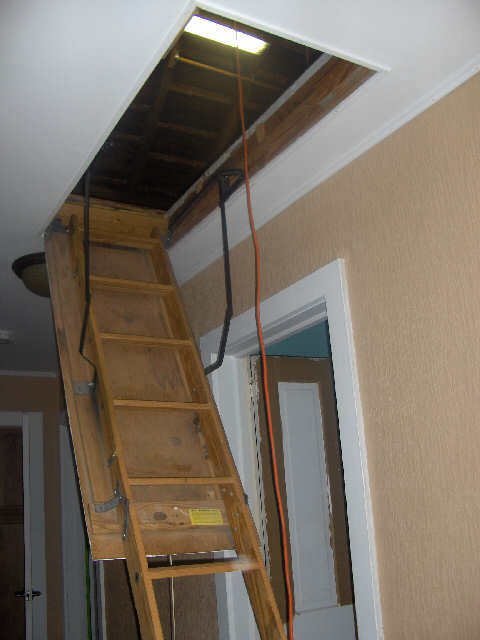 Its very easy to tell if air is getting pulled into the attic. 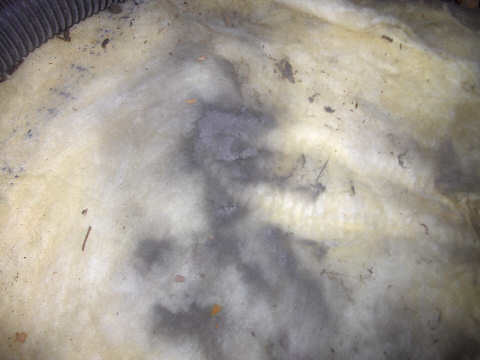 Just look for areas of dust accumulation on your insulation. Its very evident when you pull it all up. With the attic all sealed up it is now ready for insulation. Of course there are snags in the plan and some odd areas to get insulation in. Check back later to see how that goes. Sealing up the attic completely is the single biggest thing to do. Insulation doesn’t block the moment of air, with the exception of Spray foam and dense packed cellulose. Think of iot like this: A sweater might keep you warm until the wind kicks up. The best combo is a sweater with a wind breaker over it. Same for your house. Seal up all the wall headers, and attic penetrations. Install ventilation baffles. I made mine. a 1/2 inch air gap, full stud width will allow more air moment than the staple in baffles at home depot. Use a good cellulose insulation to fill all the nooks and crannies. Next is to make a cover for the attic hatch to seal it up. I used EPDM foam around the edges. works awesome. I have a couple of concerns about this. I’ll assume you wore a respirator or the correct type (there are several) filter mask. I’m also not sure if when you talk about sealing all air out of the attic, you mean only the air leaking in from heated areas through light fixtures and that sort of thing. That’s all fine- except, not all light fixtures should be sealed around and/or above. Most need some ventilation and should not have insulation on top of them at all. If you want to be super sealed you’ll need to replace the fixtures with the correct types and/or sealed boxes meant for such retro-fits. Otherwise you risk overheating and fires and possibly a denial of insurance claim. Back to the air getting into the attic. You don’t want warm humid air leaking in from living spaces. You MUST have lots of fresh outside air entering the attic from the soffits and exiting from vents in the roof and/or ends of the attic. Otherwise you can guarantee excess moisture accumulation and mold which can damage health and wood. True enough, dealing directly againse recest lighting is not recomended. What I have done for others is make a box out of fire rated drywall, and just drop this box over the fixture, and sealing this box to the attic side of the celing. That way, you can use the cheap recessed fixtures, and still get all the benefits of a sealed fixture. Seal the attic as tight as you can, then blow in your cellulose. After that, roll out a double sided perforated radiant barrier. I’ve never heard of cellulose insulation before. What brand did you use? Personally, I prefer foam insulation. It’s so much greener than fiberglass. Though can be a bit pricey, it covers holes and cracks much more thoroughly. Cellulose insulation is very environmentally friendly option since it is made up mostly of recycled material. I used comfort control insulation which is made fairly close to where I live. 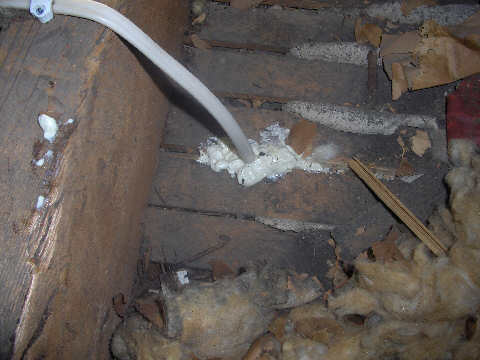 Foam insulation is great for sealing as you mentioned. However, to use it I would have had to rip out all of the fiberglass and rockwool that was already in the attic. There was no need to do that with the cellulose insulation.